If Peter Pan and the Lost Boys would have been cyclists instead of being able to fly, this is what Neverland would look like. 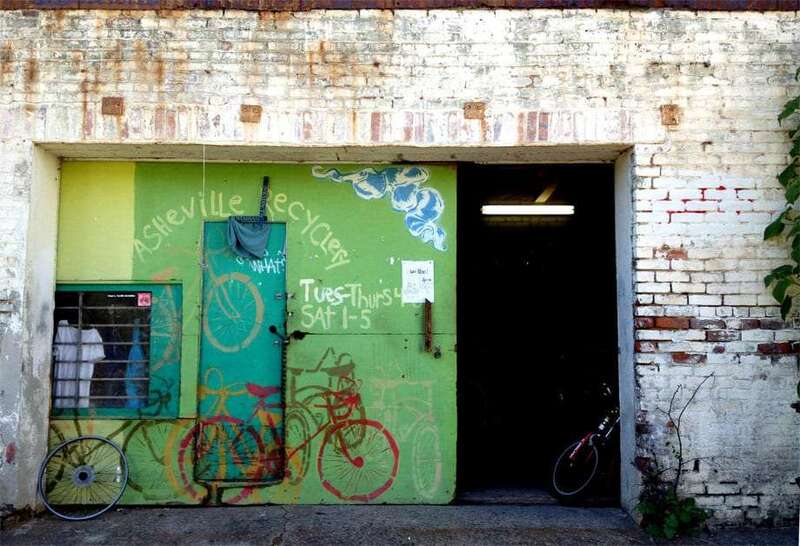 I nod and start looking around for someone who works at the Asheville Bike Recyclery, but it’s difficult to tell the staff from the volunteers, particularly as the staff are volunteers. Within a minute or so, though, a late thirties gentleman with bushy hair and glasses emerges from the piles of frames, gears and seat posts. “Can I help you?” He’s smiling. You can tell that everyone here absolutely loves bicycles, and Asheville itself is an incredibly bike friendly city, even without official bike lanes and plenty of hills. Everywhere you go the tell tale sign of a right pant leg rolled up to avoid getting grease from your chain on your jeans can be found. I tell him I’m interested in volunteering, and maybe bringing my ten year old son to volunteer next weekend as well. I assure him, however, that I don’t know that much about bikes, which isn’t completely true—I used my bike as my primary means of transportation for nearly a decade before I began traveling fulltime—but I want to know what the experience might be like for someone who knew absolutely nothing about fixing a flat tire or even oiling a chain. “So it would be cool to bring my son along with me, too? He’s only ten, is their an age limit or—” he stops me right there. “Hey, that’d be fine. 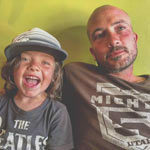 Any age will do,” the kid working on the bike wheel looks up and smiles again. “Get ’em started young!” he declares. I see he’s wearing a shirt that reads My other car is a bike. Tag a bike, fix it up, and it’s yours. I’m primarily interested in just helping out, and giving my kid a chance to see that volunteering somewhere can be a good time, but I’m interested in how the whole process works as well. The idea behind bike recycleries, sometimes called freerides, is that you volunteer your time helping to fix bikes, clean the shop, or just organize things a little better than they were before, and in exchange you get some experience working on things mechanical, earn a little elbow grease, and eventually, a bike of your own. “You come in and tag a bike,” the bushy haired man tells me, pointing around at a few random bikes scattered throughout the shop that have yellow tags like you might see in 1950’s mattress shop, tied to the handlebars of the various rides, “and when you’re done working on it we ask you to make a donation. Then it’s yours.” Donations can be monetary, of course, but they’re also looking for people to donate something even more valuable than cash: time. Another volunteer walks up with what looks like the inner workings of the flux capacitor, looking a bit perturbed at what he’s done to what was most likely formerly a BMX bike’s rotor, and the bushy haired man excuses himself before I get a chance to even ask his name. 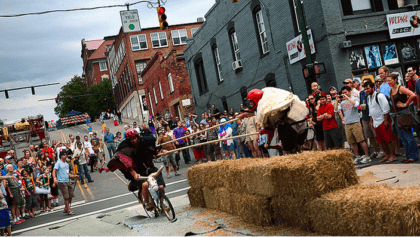 Asheville Bike Recyclery Volunteers jousting during the Lexington Avenue Arts & Fun Festival. I leave the cave of tubes and tires and make definite plans to return the next weekend. Volunteering isn’t for everyone, but this isn’t just any volunteering. Bikes are something nearly all of us have in common, at some point in our lives we were all youths pedaling up hills and skidding our back tires through the driveway. They were around before cars, and though the past couple of generations did their best to make the roads no place for two wheels and the will to pedal faster, there’s been a real renaissance in bicycling as a valid form of transportation in cities all across the country. Asheville is no exception, and if you’re looking for a way to make the world a better place, helping yourself or someone else get their hands on a method of transportation that keeps the earth as green as it does your stomach thin isn’t a bad start.